Personally, I don’t have much going on for snakes. Luckily, Franc Vila’s Cobra time piece doesn’t bite. Although a Cobra isn’t the first thing come to mind when looking at these time pieces, with some imagination I can see the resemblance of a Cobra’s head in the watch case. However, with the same kind of imagination, I can see a skull in the shape of the dial, the sub dials being eyes and mouth. The version pictured above has been created to celebrate Spain’s World Cup victory in July 2010 against the Orange team from The Netherlands. It is another edition of the ‘Cobra’-line of watches that Franc Vila introduced during BaselWorld 2010. 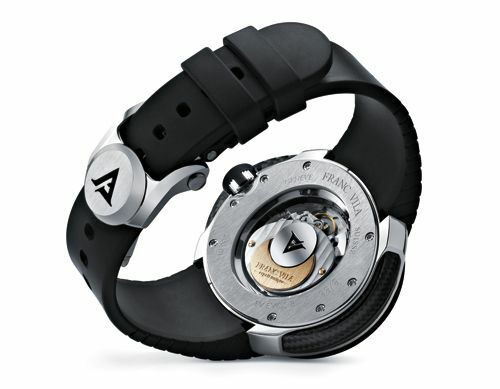 Limited to 88 pieces, as all Franc Vila watches are. The Cobra line has been introduced as a sports watch pur sang, explaining the use of hardened and blackened steel (DieHard Extreme), carbon and titanium. Besides the special Spain-strap, the Cobra time piece comes also with a rubber strap (as usual on the Cobra models). List price of the Cobra models is around $28,000, except for the tourbillon version. 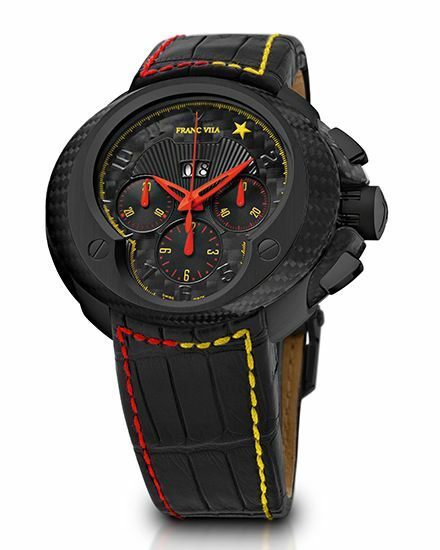 The version above is being called the ‘Yellow’-edition, due to its yellow hour markers and brand’s logo on the dial. As you can see, with a rubber strap and fancy looking clasp. The in-house chronograph movement is caliber FV8Ch, with a power reserve up to 42 hours. Franc Vila’s Cobra watches are water resistant to 300 meters.